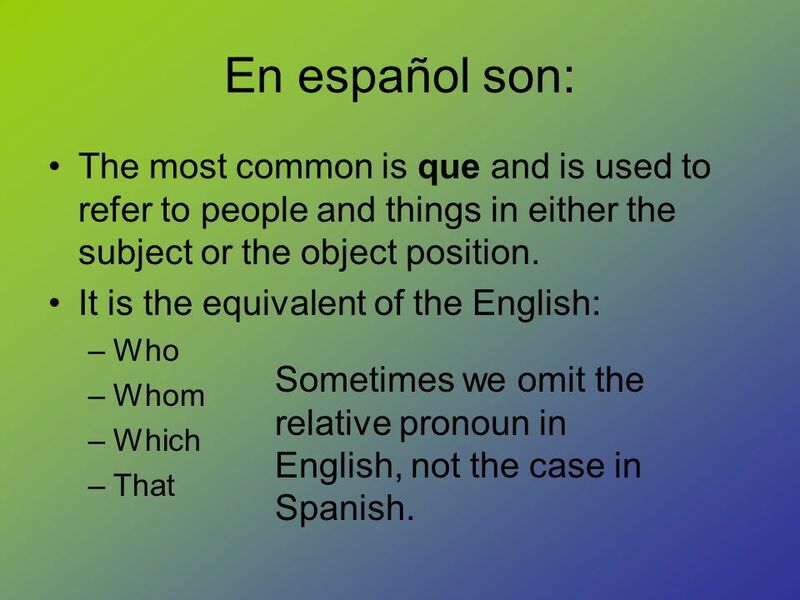 3 En español son: The most common is que and is used to refer to people and things in either the subject or the object position. 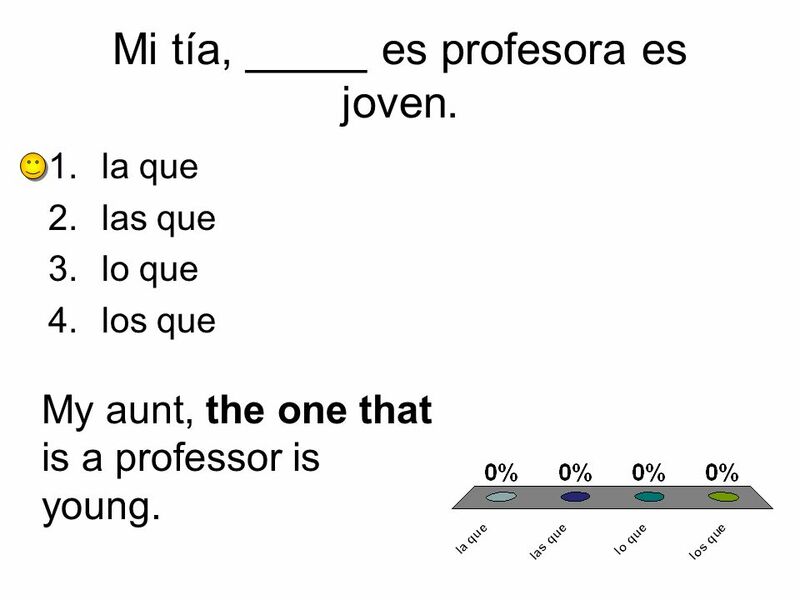 It is the equivalent of the English: Who Whom Which That Sometimes we omit the relative pronoun in English, not the case in Spanish. 4 La señora _____ es anciana compró la casa. This has the plural quienes, but does not change with masculine and feminine. 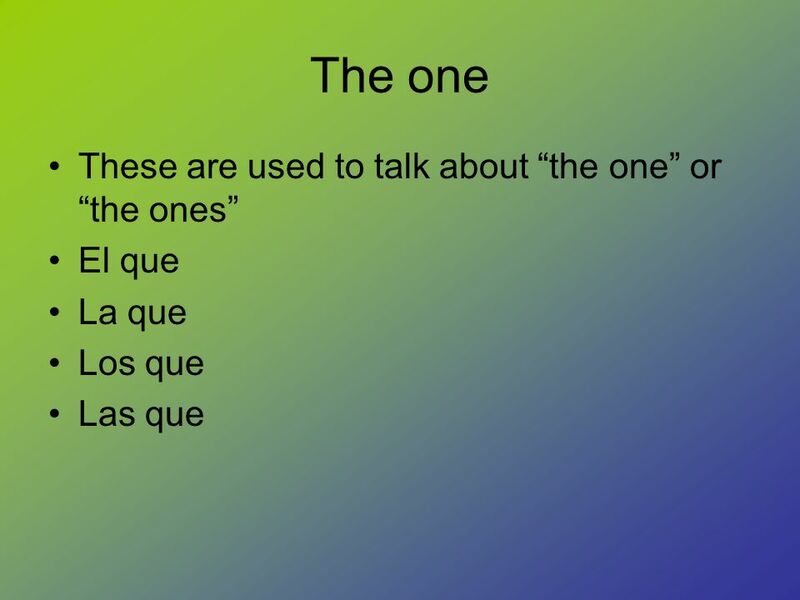 Que or quien maybe be used when it is refering to the direct object pronoun (whom? or what?) 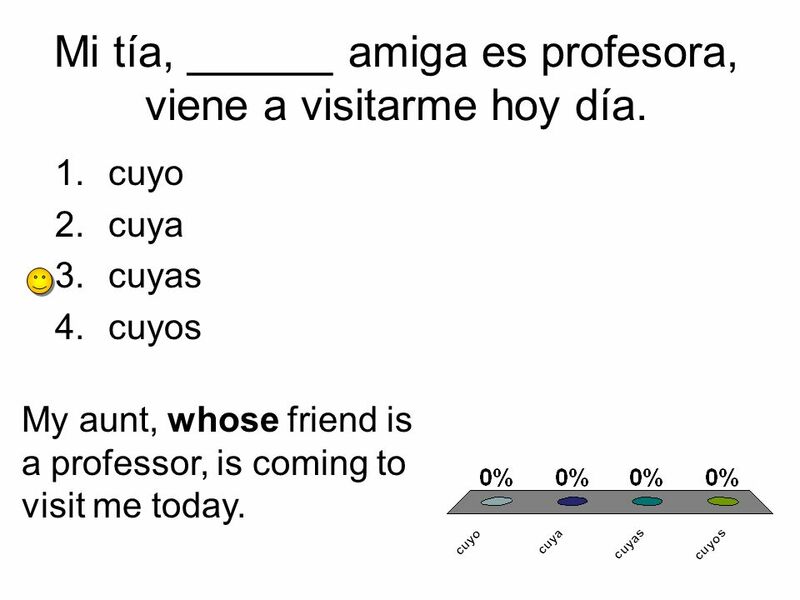 If the relative pronoun occurs after a preposition you must use quien. 6 La señorita de _____ estoy pensando no está aquí. que la que quien cuya The young lady of whom I am thinking is not here. 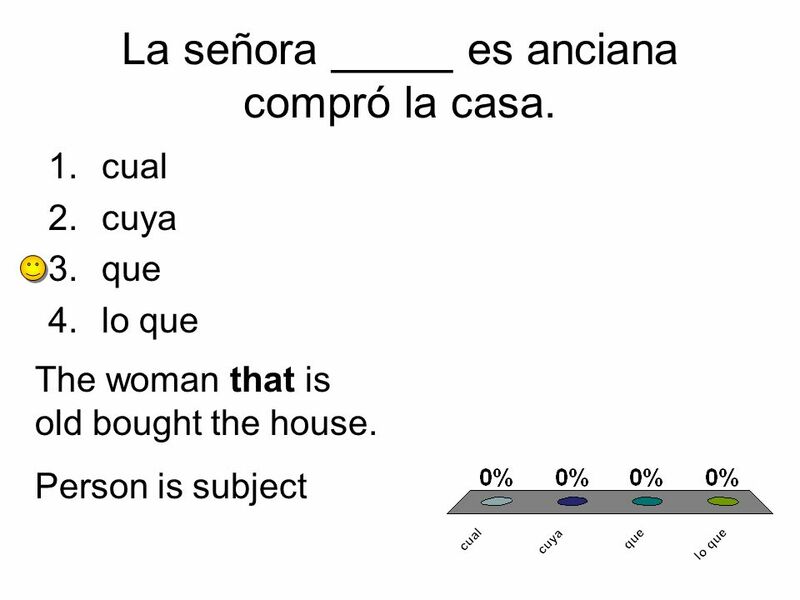 7 La casa en ____ estoy pensando está en Oregon. 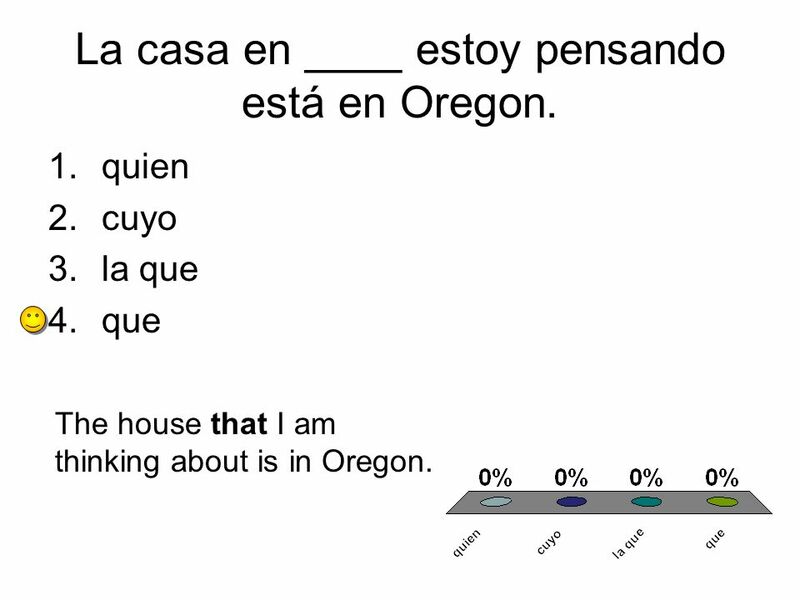 quien cuyo la que que The house that I am thinking about is in Oregon. 9 Mi tía, _____ es profesora es joven. la que las que lo que los que My aunt, the one that is a professor is young. 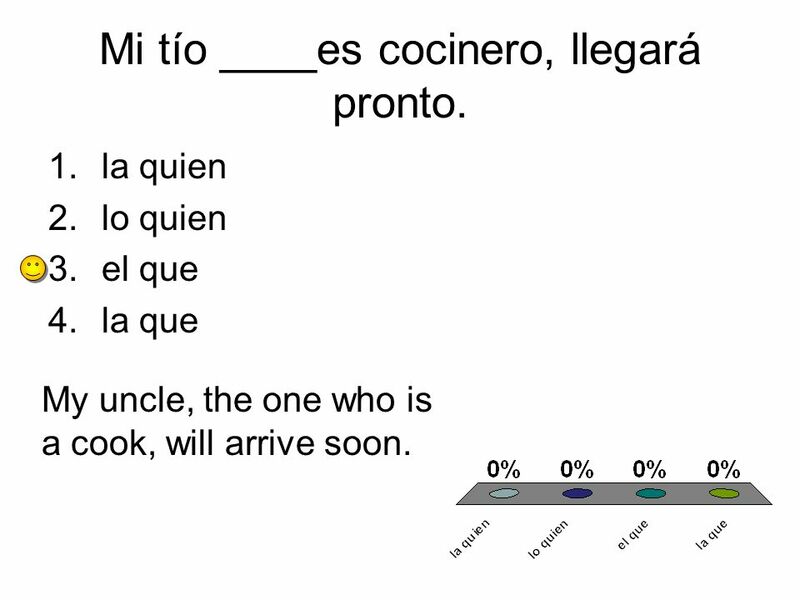 10 Mi tío ____es cocinero, llegará pronto. la quien lo quien el que la que My uncle, the one who is a cook, will arrive soon. These are used to refer to people, not to ask questions, and they must agree in gender and number. 12 Mi tía, ______ amiga es profesora, viene a visitarme hoy día. cuyo cuya cuyas cuyos My aunt, whose friend is a professor, is coming to visit me today. 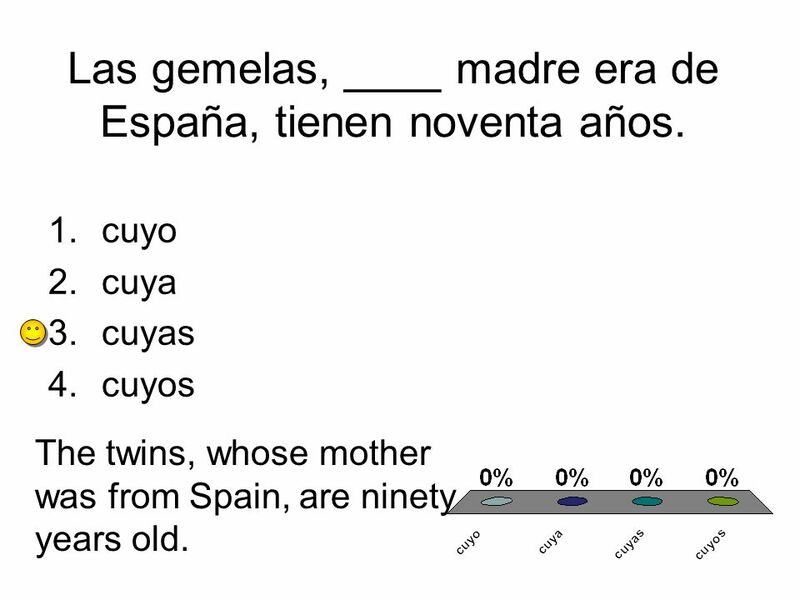 13 Las gemelas, ____ madre era de España, tienen noventa años. cuyo cuya cuyas cuyos The twins, whose mother was from Spain, are ninety years old. 14 ¿_______ es la tarea? 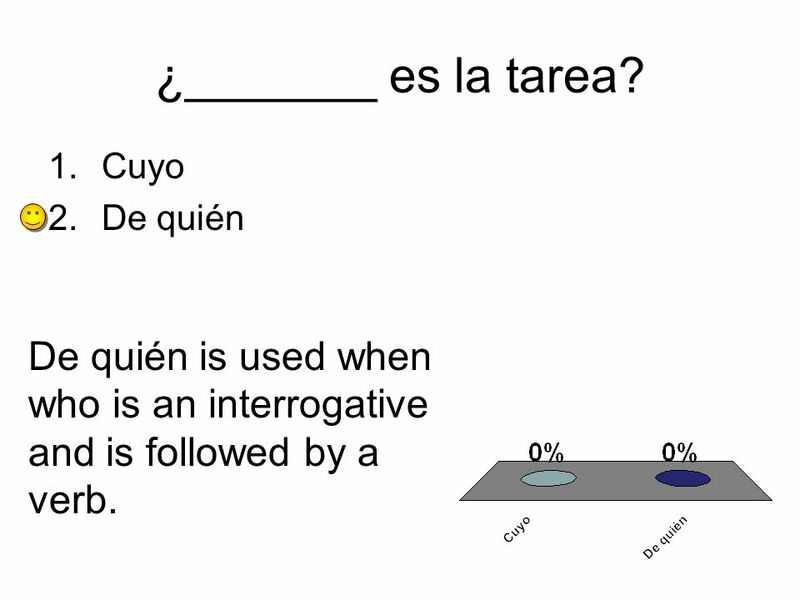 Cuyo De quién De quién is used when who is an interrogative and is followed by a verb. 16 Final thoughts: It must be emphasized that the previous comments on the relative pronouns are intended as general guidelines only. 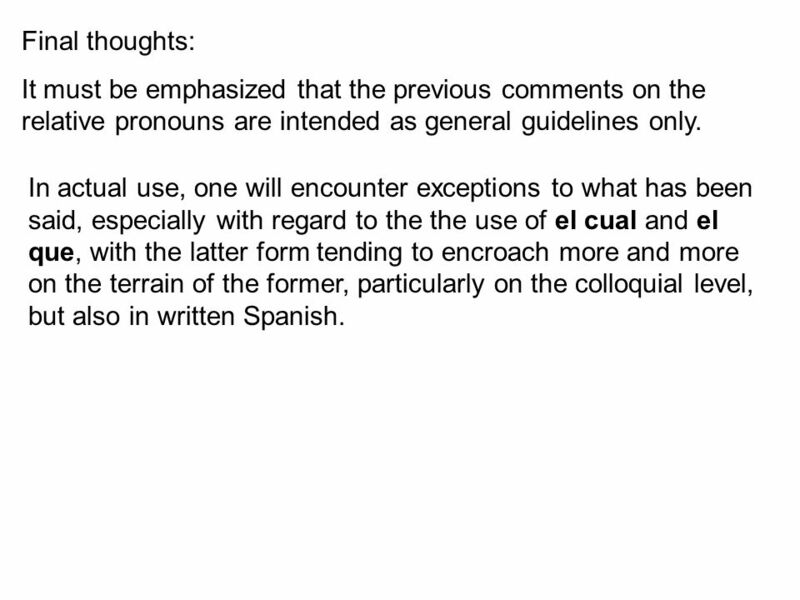 In actual use, one will encounter exceptions to what has been said, especially with regard to the the use of el cual and el que, with the latter form tending to encroach more and more on the terrain of the former, particularly on the colloquial level, but also in written Spanish. 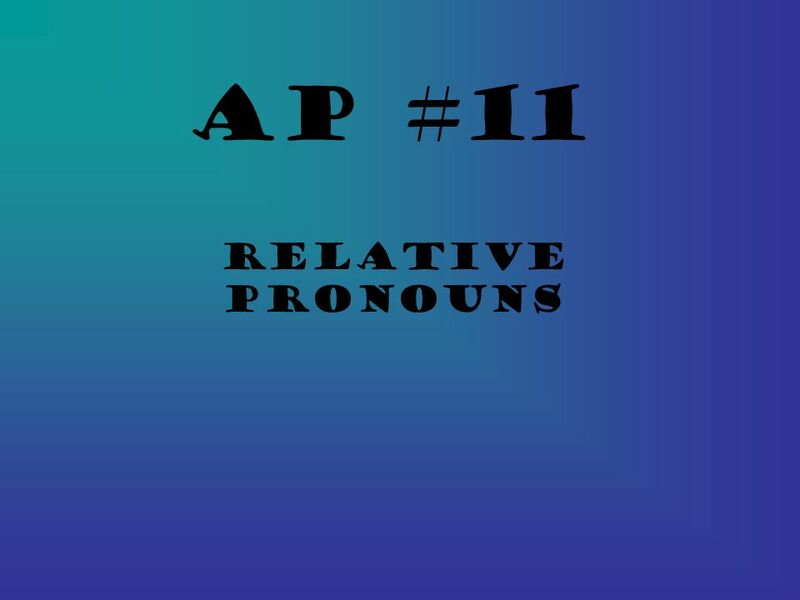 Download ppt "AP #11 Relative Pronouns." 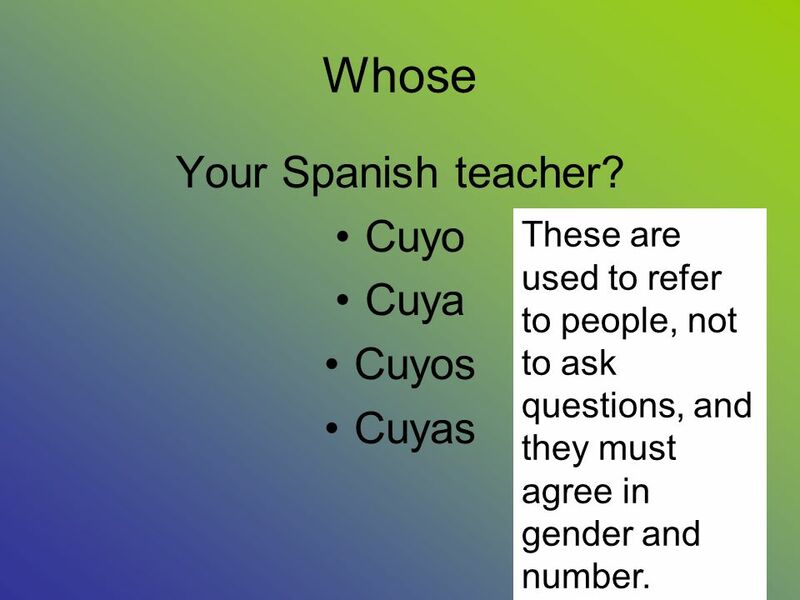 Gender In this presentation, we will look at two very important concepts in Spanish: gender and agreement. 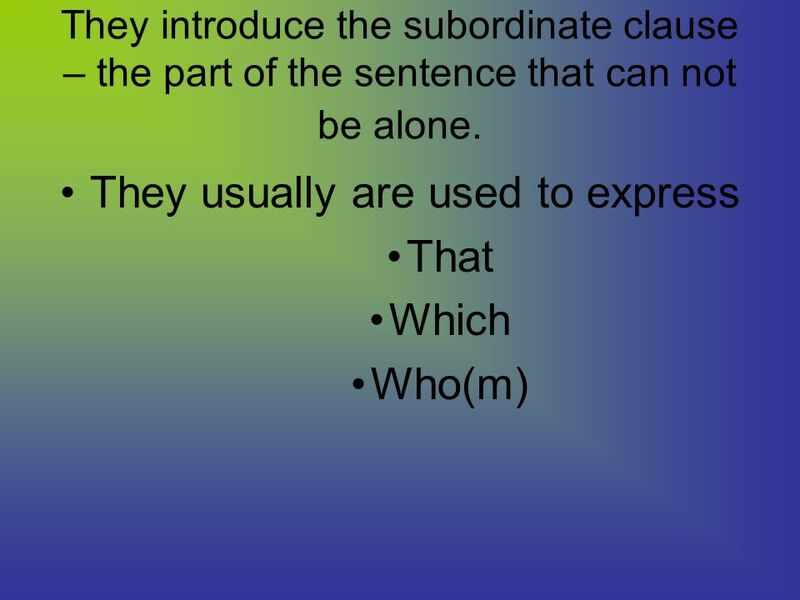 When we first studied the subjunctive, we learned that two clauses can be connected to form a sentence by using the relative pronoun que. Ex. Tienen un. 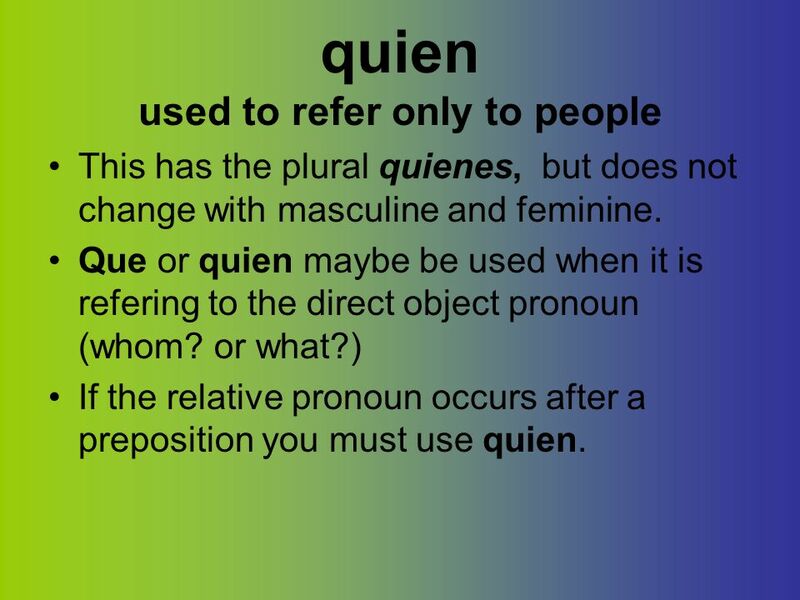 QUE and QUIEN Used as RELATIVE PRONOUNS SOME TERMS TO KNOW MAIN CLAUSE - contains a subject and verb and can stand on its own. This is my brother. RELATIVE. 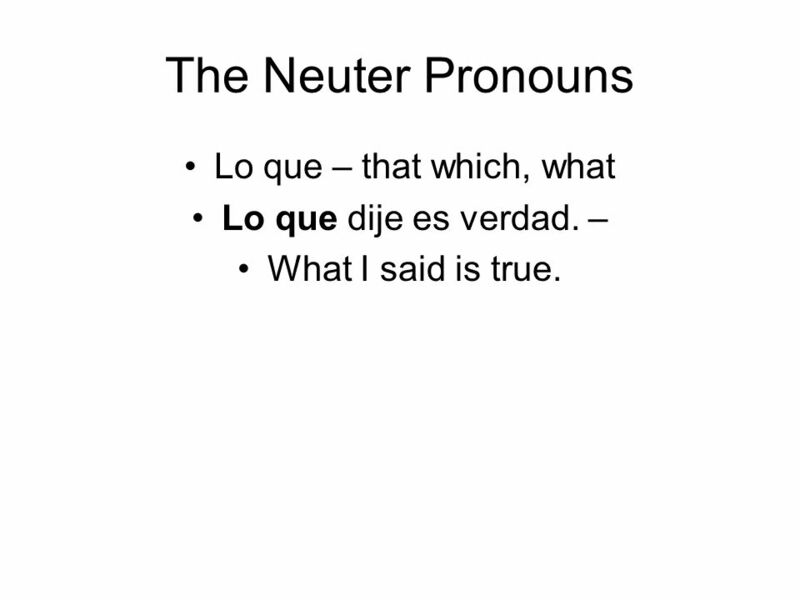 Nouns: Gender/Agreement Gender In this presentation, we will look at two very important concepts in Spanish: Gender Agreement. Sentence Structure in Spanish Grade 7 Spanish Señora de Flores.